On this three day weekend, Dan and I decided on a road trip to Philly to satiate our historic curiosity, see good friends, and to taste some amazing food, of course. Quickly learning that Philly is indeed a foodie haven, we bumped into all sorts of delicious sites that made our visit complete, already piquing our interest for an upcoming visit. A big highlight of our trip was a visit to the historic Reading Terminal Market, which since 1893 has been a gathering place for the city's local food artisans. Reminding me of Seattle's Pike Place Market, Reading offers up a medley of amazing food merchants from dairy & cheese, specialty desserts and confections, meats & poultry, Amish goodies, housewares, books & crafts and a lot more. 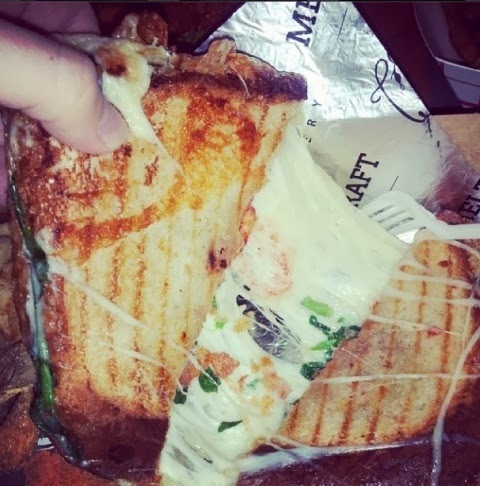 Meltkraft - The second outpost of Valley Shepherd Creamery's retail location, this amazing "melt shop" can also be found in Park Slope, Brooklyn. Immediately drawn by its pungent smell, I couldn't resist a heaping, cheesy sandwich and drew my eyes to the Melter Skelter (aka Raclette) with pickled green tomatoes, jalapeno and watercress. The cheese was melted to perfection and created the most amazing, well-done crust on the outside of the bread. Loving the thin pieces of green tomatoes, they added a hint of sophistication and a contrasting sour flavor. Wursthaus - When Dan spotted a German schnitzel stand at the market, he had to go for the gold with this classic pork schnitzel sandwich. 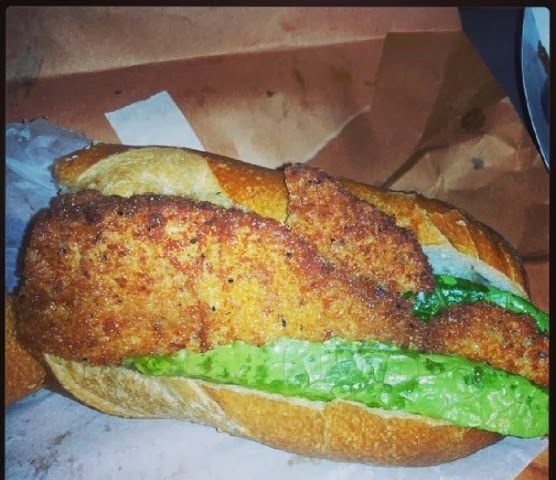 Really generous in size, it was easily a foot long heaping sandwich with beautifully crispy pork cutlets, romaine lettuce and a spicy grain mustard on a fluffy kaiser bun. I had a bite of the pork and despite it being fried, it felt light and fresh. Flying Monkey Bakery - Being that I'm a sucker for dessert, it didn't take long to be drawn in by Flying Monkey's whoopie pies - and there were so many to choose from. 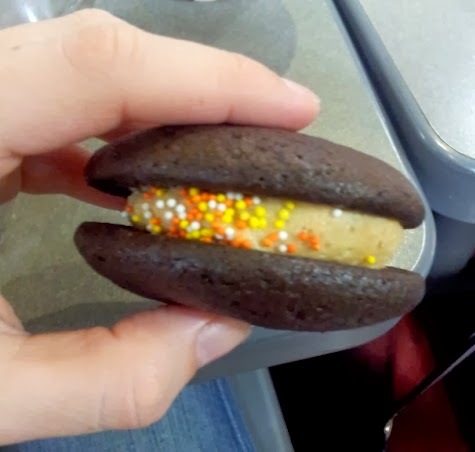 Loving a classic chocolate and peanut butter combination, I went for it, and immediately understood what the hoopla is all about. The cookie dough is as soft as a cloud, while the filling is light (almost like a mousse) and really smooth. A few sprinkles give it a jolt of texture, which was fun to bite into. 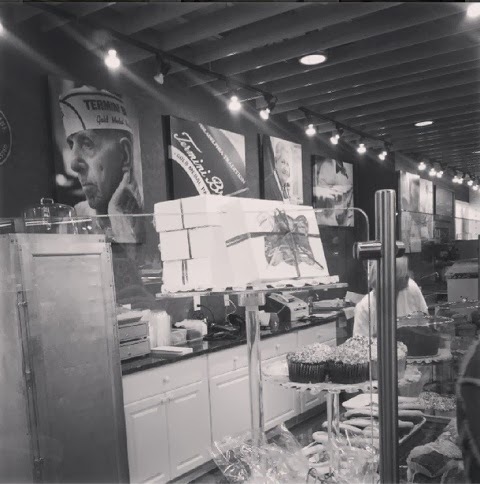 Have you been to Philly's Reading Terminal Market? What are some of your favorite food purveyors?